Looks like .5 at the homestead so far today. Great drive to Jax. All backroads after the initial spurt up the tollway. Hello Alberto. Looks like Gomey's in the wet zone for now. I'm.at just over .25 with today's sprinkles. We'll see how the weekend goes. Hey Aug, I think those loopty loops are scenarios based on the ridge building west and possibly above the system - shoving it back around and south into the gulf. That may be quite possible. We shall see in the coming days. Pasco, Inland Sarasota, and Pinellas. watch area through the period. ground if flooding is observed. poor drainage areas as well as the ponding of water on roadways. conditions for small craft operators. Morning. Always enjoy Levi's video's. Yeah Largo, this looks like a gomey storm. Still a good 72 hours out so there'll continue to be slight adjustments in track either east or west. StAugustineFL wrote: Morning. Always enjoy Levi's video's. 24 hour forecast rainfall. Looks wet for bills. Billsfan..is there alot of flooding so far down your way? over Flamingo, moving northwest at 25 mph. * Funnel clouds will be possible with this storm. Northwest Cape Sable, Middle Cape Sable and Flamingo. waterspouts. Move indoors and stay away from windows. knots, with frequent gusts near 40 knots this afternoon. * WAVES/SEAS...Seas will build as high as 12 feet. warranted -- primarily for the latter half of the period. Due to the threat of heavy rain and potential flooding, Gov. Rick Scott has declared a state of emergency in all 67 Florida counties. “As we continue to monitor Subtropical Storm Alberto’s northward path toward Florida, it is critically important that all Florida counties have every available resource to keep families safe and prepare for the torrential rain and severe flooding this storm will bring. Today, I have declared a state of emergency in all 67 Florida counties to make sure that our state and local governments are able to coordinate with federal partners to get the resources they need," Scott said. Storm force tonight and Sunday. possible due to a tropical storm within 48 hours. just saw there are some power outages around Florida already, i lost internet and cable for awhile. 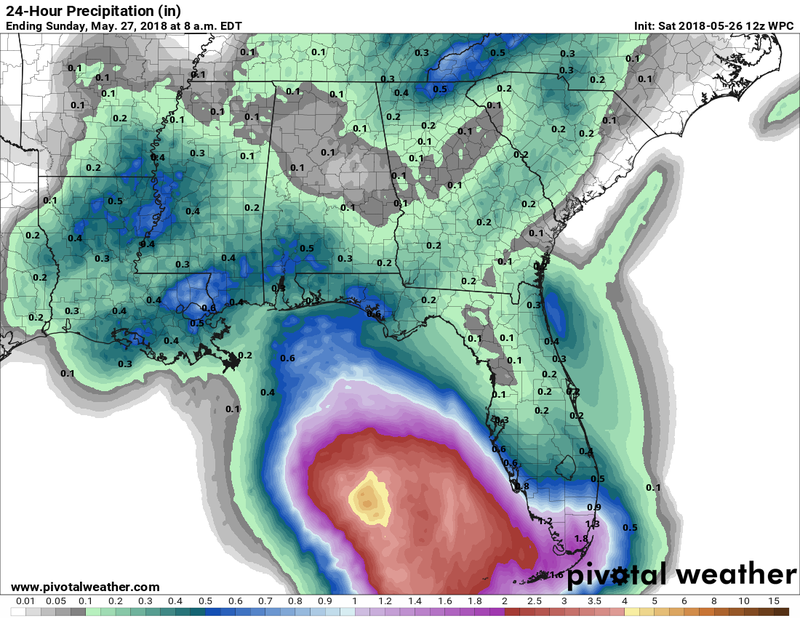 St.Pete...stay more alert thru this, looks like its trying to reform a new LOW thats more eastward..we could..be getting some of this TS...good luck down there ok.
Good luck all my west coast friends and Gomey. Looks like I'm in the clear. Love these clouds and cooler temps. BillsfaninSoFla wrote: Good luck all my west coast friends and Gomey. Looks like I'm in the clear. Love these clouds and cooler temps. hi Billsfan,glad your area is ok. I was watching the recon data earlier and that new center is quite a bit further north, however, it is also just a teeny bit further west. Today has ended up being pretty decent here... Lots of clouds and the sprinkles started while I was out grocery shopping. Nothing to really speak of, just sprinkles. Another great Levi update. The young man has a sharp mind. Very pleasant day up here. Not a hint of rain, comfortable temps, and a nice breeze. Per Levi's vid and some NWS discussions, there's going to be a dry slot somewhere tempering rain for a spell. 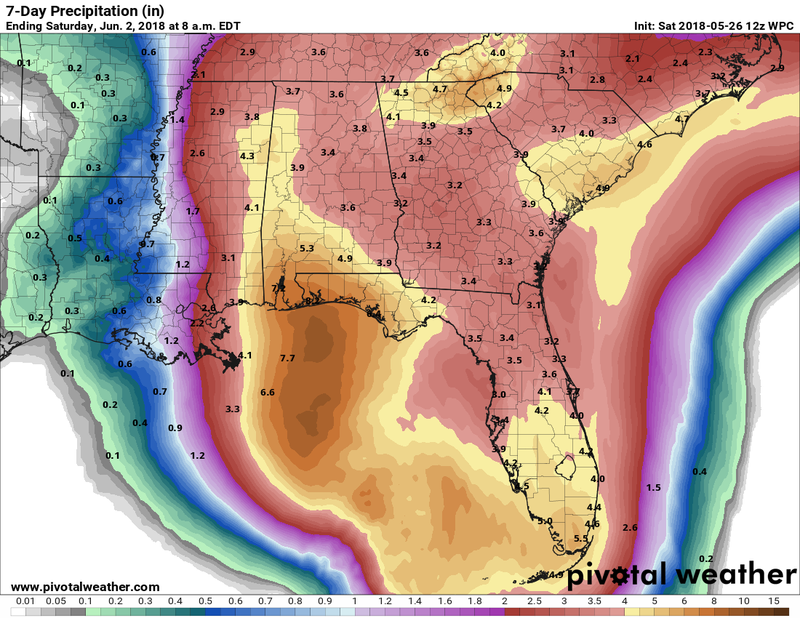 WPC is also now going lower in their overall QPF for parts of the peninsula.